Standing on the rolling terrains of a coffee plantation in Honduras, moved by the compassion yet challenges faced in the life of a coffee farmer, The Chapola Project was formed. A collaboration by 4 Specialty Coffee Roasters (Tim Adams Specialty Coffee, Dramanti Artisan Roaster, The Mailing Room and Cloud Catcher) with the intention to improve the quality of life for coffee producers around the world. From these early beginners each roaster has progressively developed their own individual and customized approach to the project. For us at TASC, this has evolved into supporting many humble coffee producers each with their own unique stories. We do this through purchasing above and beyond standard market rates ensuring our premium prices are received by the people who deserve it most. Purchasing coffees through non-for-profit events like Project Origins ‘Late Harvest: Best of Honduras’ auction and the Cup of Excellence. Through The Chapola Project we believe it is our duty to offer guidance in pre-harvest techniques and to donate and help build infrastructure at the farm level. Building these sustainable relationships not only improve the lives of our producers, but the quality of coffees we continue to have access to. Our most exciting project to date is our partnership with the Lanza Family from Honduras, in the purchase of our Chapola farm Finca Chapola in the Santa Barbara region of Honduras. Finca Chapola will not only help support the Lanza family, but as we learn together we will continue to educate neighbouring producers, as well as using our farm as an educational platform for Coffee Professionals, Baristas, Business Owners and Roasters from around the world. 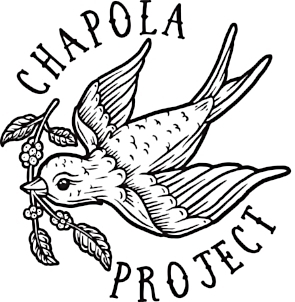 WHAT can you do to support chapola project? Combining small lots from Ethiopia, Brazil and Colombia. This coffee gives us the opportunity to work up close and personal with our producers, giving back where we can and supporting our farmers and their families. $2 per kg goes back to our Producers. This coffee is sweet & complex, combining Valrhona chocolate, stewed cherries & cranberries with an elegant acidity. Super silky toffee body and a long, sweet finish. Check out our T-shirts, Coffee & Education Tools. Thank you for supporting us as and giving us the opportunity to give back to our producers around the world.